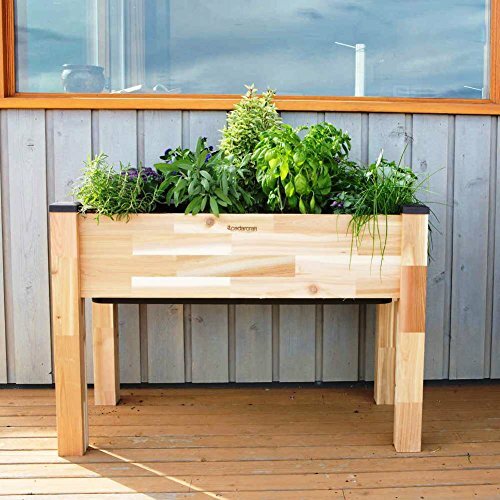 Cedarcraft's Elevated planter combines the flexibility of container gardening with the convenience of self-watering. Perfect for patios, balconies or backyard gardening. Easily grow tomatoes, vegetables, herbs or your favorite flowers anywhere you want. This self-watering planter ships complete in a single box and includes easy to follow instructions. Assembly in minutes with no tools required! Keeps plants lush and green even if you're not around. 4 gallon reservoir with water level indicator. | Naturally rot & insect resistant. Wicking system keeps plant roots moist without overwatering. Easy working height minimizes back and knee strain. | 100% Canadian Western Red Cedar - Untreated. Elevated design protects plants from rabbits, gophers and pets. If you have any questions about this product by CedarCraft ®, contact us by completing and submitting the form below. If you are looking for a specif part number, please include it with your message.